5MS® Fracture System uses interchangeable 2.4 and 2.7 Screws for all Plate types, with the exception of the Large Plantar Plate, which is compatible with 3.0 and 3.5 Screws only. 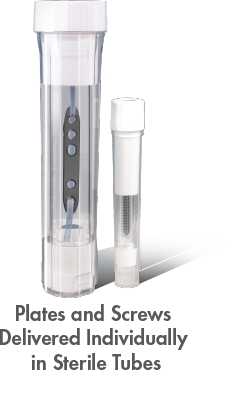 Plates and Screws are delivered sterile in individually packaged tubes while certain consumable instruments are sterile packaged in a disposable tray. A reusable Instrument Set is provided with color-coded banding to differentiate Screw / Instrument sizes. 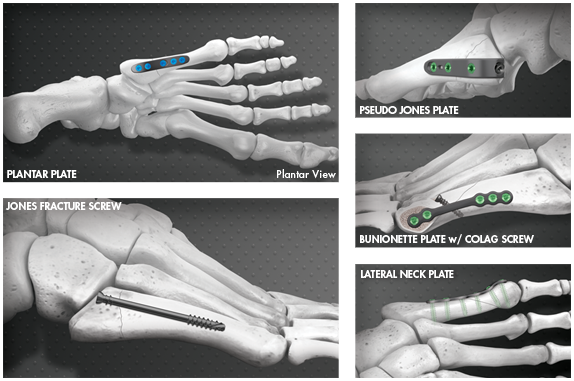 The 5MS® low profile Plate System provides ease of plating specifically for proximal 5th metatarsal fractures or Jones Fracture indications, IM screw nonunions, curved 5th metatarsals and sclerotic nonunions. The anatomically contoured Plantar Plates are designed for increased biomechanical strength, resisting rotational instability and plantar-lateral gapping at the tension side of the fracture. The revolutionary 5MS® Jones Fracture Screw design combines the rotational stability of a headless screw with the compression levels and ease of use of a conventional headed lag screw. Jones Fracture Screws feature a reduced cannulation size for increased Screw strength, while facilitating optimal Screw placement and use of a larger Guide Wire for reduction. These unique 5MS® Reduction Forceps are specifically designed to maintain alignment and compression of displaced 5th metatarsal fractures during provisional fixation. The barbed and straight ends offer increased utility over standard forceps. The barbed end is designed to provide midshaft purchase while the curved end spikes into the proximal tuberosity.